Montana is a special state, especially when you consider that it’s only home to about one million residents. It entered the Union on November 8, 1889, one week after South Dakota and just a few days before Washington. The 41st state is also one of the biggest (geographically) in America, even though the most populous city in the state, Billings, has just over 100,000 people. Montana is full of paradoxes, as the Treasure State contains both flat plains and high mountain peaks. The absolute best time to visit is in the middle of summer, although hardier travelers will also find plenty of adventure in the autumn and winter months. Before you plan a vacation to Montana, it’s a good idea to learn a bit more about the place often referred to as Big Sky Country. Believe it or not, one of the best college towns in the United States is hidden away in Montana. Missoula is located in the western part of the state near the Idaho panhandle, and the city of about 70,000 residents is home to the University of Montana. UM has the second-largest enrollment in the state, with Montana State University in Bozeman claiming the top spot. The campus is ridiculously scenic. It’s located at the foot of Mount Sentinel, and if you for some reason can’t find Mount Sentinel, look for the gigantic hillside “M” that’s visible from the campus. Locals and tourists alike hike to the “M” to get a workout, and if you really feel like pushing yourself, you can keep going for another mile until you reach the top of the mountain. Either way, you’ll find a great view of both the university’s campus and the city of Missoula. When they’re not hiking mountain trails, residents of the Missoula area love to cheer on the University of Montana Grizzlies in sports like football, basketball, and more. Since this is Montana, there’s even an intramural Alpine Ski team. Appropriately enough, the Grizzlies compete in the Big Sky conference. After the game, check out one of Missoula’s legendary breweries, including the oldest active brewery in Montana. Missoula is considered the cultural hub of the state, so you can attend events like the Montana Book Festival in September or the River City Roots Festival in August. Montana has a rural reputation, but you’ll still need a functioning smartphone to make sure you’re headed to the right brewery or festival venue. But when you’re on the road, your eyes need to be on the road rather than on your phone. Missoula is one of several places in Montana that prohibit the use of handheld devices while driving, so look for AT&T Stores in Montana that can get you set up with a hands-free device. That’s a good idea regardless of where you are, but Missoula’s status as a college town with lots of pedestrians makes it even more important that you stay focused on driving. 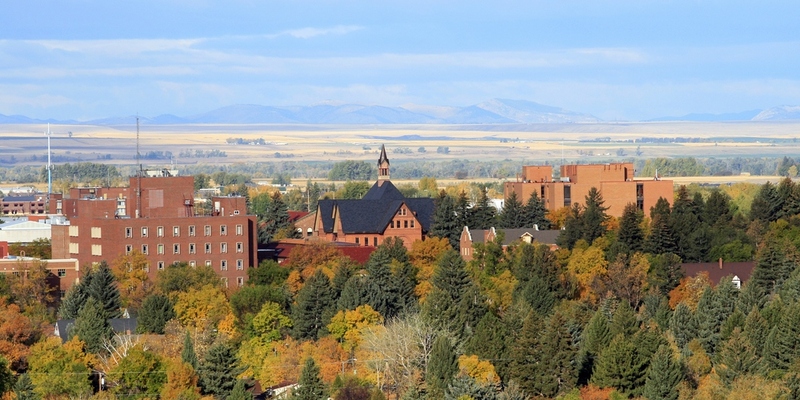 Speaking of college towns, if you drive 200 miles east on Interstate 90, you’ll find yourself in Bozeman, home to Montana State University. UM and MSU are big rivals, so be prepared to get some strange looks if you walk around in UM apparel. Bozeman is smaller than Missoula, with about 45,000 residents. If anything, the smaller size makes it feel even more like a college town. Missoula is west of the Continental Divide, while Bozeman is to the east of it. Bozeman’s location means it is both colder and snowier than Missoula, so take that into account when planning your visit. Some winter sports enthusiasts love this element about Bozeman, while other people long to get back to the relatively warmer confines of Missoula. In general, Bozeman is a great place for outdoor activities. If you like national parks, Yellowstone National Park about a 90-minute drive away from the city.